For 40 years, Louis Armstrong Stadium played host to some of the most memorable moments in tennis history. Today, a new thread in the rich and vibrant tapestry of the US Open was woven. Four-time US Open champion John McEnroe joined internationally acclaimed musician Wynton Marsalis and former New York City Mayor David Dinkins in officially opening the new Louis Armstrong Stadium at a dedication ceremony Wednesday morning, hosted by USTA President Katrina Adams. “This beautiful new 14,000 seat stadium—complete with its own retractable roof—will provide the US Open’s great players with another grand stage on which to perform, and also provide our world-class fans another great venue to experience all the thrills and excitement of those performances,” said Adams. 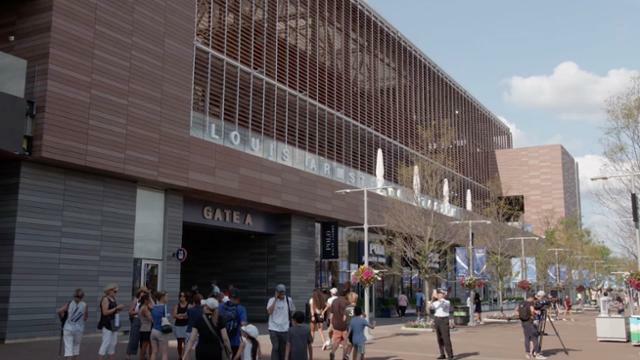 The stadium, the final piece of a $600 million five-year strategic transformation, will be used for its first official match when the main draw of the 2018 US Open begins Monday. The stadium will also host a dedicated night session for the first week of the tournament, giving the US Open two stadia with night matches for the first time in tournament history. Headlining Wednesday’s dedication ceremony, attended by an estimated 1,800 fans on hand during Fan Week, was Marsalis, who got the fans on their feet with a lively performance. August 22, 2018 - Wynton Marsalis performs at the grand opening of Louis Armstrong Stadium at the 2018 US Open. August 22, 2018 - Katrina Adams, USTA President and Chairman, speaks at the grand opening of Louis Armstrong Stadium at the 2018 US Open. August 22, 2018 - Katrina Adams, USTA President and Chairman, shakes hands with John McEnroe at the grand opening of Louis Armstrong Stadium at the 2018 US Open. August 22, 2018 - John McEnroe speaks at the grand opening of Louis Armstrong Stadium at the 2018 US Open. August 22, 2018 - John McEnroe, former mayor David Dinkins, Melinda Katz, Katrina Adams, USTA President and Chairman, Queens Borough President, and Gordon Smith, USTA Executive Director and CEO, cut the ribbon at the grand opening of Louis Armstrong Stadium at the 2018 US Open. August 22, 2018 - Gordon Smith, USTA Executive Director and CEO, and former mayor David Dinkins stand as Wynton Marsalis performs at the grand opening of Louis Armstrong Stadium at the 2018 US Open. August 22, 2018 - Katrina Adams, USTA President and Chairman, Gordon Smith, USTA Executive Director and CEO, former mayor David Dinkins, and Daniel Zausner, NTC COO, stand with Wynton Marsalis as he performs at the grand opening of Louis Armstrong Stadium at the 2018 US Open. Marsalis, accompanied by an eight-piece jazz band, praised the new venue and said it would have made Louis Armstrong proud. “The USTA's commitment to Mr. Armstrong's name speaks to their understanding of American culture and to Louis' enduring legacy,” he said. “It also reaffirms his place in the history of Queens, of New York City and of his national status as an American ambassador of the first order. Other dignataries joining Adams on stage were Queens borough president Melinda Katz; Oscar Cohen, a founding member of the Louis Armstrong Educational Foundation; USTA Billie Jean King National Tennis Center Chief Operating Officer Danny Zausner; and Rossetti Architects president Matthew Rossetti. Members of PS143Q Elementary School and the Louis Armstrong Educational Foundation and Museum were also in attendance, as were ambassadors for Net Generation, the official youth tennis of the USTA. SEE ALSO: The 32 seeds for both the men’s and women’s singles draws were announced on Tuesday, as a full complement of the game’s top players descends on New York for the 2018 US Open.